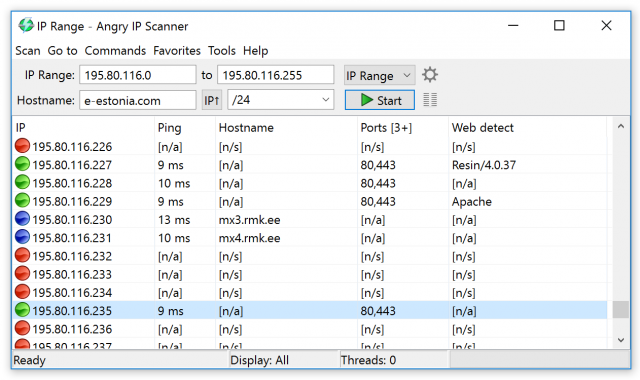 Angry IP scanner is a very easy to use, fast network IP scanner – basically a cross-platform IP address and port scanner. It can scan IP addresses in any range as well as any their ports, it’s also very lightweight and doesn’t require any installation, it can be freely copied and used anywhere. I’ve been using Angry IP for years. It is my go-to Windows GUI scanner. Also one of the few that doesn’t trigger the malware scanners I use at home and in the office. I prefer Cain just because of the speed for a basic scan of alive hosts but that can be a real pain to use if you have malware protection running. Especially when it is a work computer and you need to add exclusions and explain why you added it to the head of IT security. Yah it’s a solid tool and the portability is great. Not triggering malware alerts is a bonus as most others (especially those with password cracking capabilities) do.